TALLAHASSEE -- Almost unanimously, the Florida Legislature on Monday voted to give homeowners a break from soaring property insurance premiums, promising rate cuts between 10 and 55 percent on their hurricane coverage. South Florida home and condominium owners are expected to see some of the biggest reductions, but the amount of rate relief will depend on where you live and your insurer. Republican Gov. Charlie Crist, who pushed legislators during the seven-day emergency session for meaningful rate reductions statewide, sent signals he expects to would sign the legislation into law and commended Republicans and Democrats for reaching the final compromise. "It's amazing to see what you can accomplish when you don't care who gets the credit,"
Crist told legislators. "They said it could not be done, but you did it." The House was first to approve the broad 167-page compromise, finalized during marathon weekend negotiations, passing it 116 to 2 at 5:15 p.m. The Senate followed 14 minutes later with a 40 to 0 vote. All South Florida legislators voted in favor of the reform package. Approval came on the final day of the session called to address the state's property insurance woes, which are threatening to force Floridians out of their homes because of double- and triple-digit insurance premium increases. "We tried to stop the bleeding," Senate Banking and Insurance Committee Chairman Bill Posey, R-Rockledge, said. "But we don't claim the bill is perfect and we don't claim the work is done." Although no hurricane made landfall in Florida in 2006, the insurance companies have blamed skyrocketing rates on the disastrous hurricane seasons of 2004 and 2005, when eight storms, including Katrina, ravaged the state. "If we hadn't passed the bill, we would have been in terrible shape," said Senate Democratic Leader Steve Geller of Hallandale Beach. "The economy of the state was grinding to a halt." Homeowners, including condominium residents, will see some relief when their policies renew during the next several months. Businesses will also see some relief, although not as much. Rates will fall, under the plan approved, by allowing the private insurers to buy cheaper reinsurance from the state, and requiring they pass along the savings to consumers. South Florida customers of Citizens Property Insurance Corp., the state-backed insurer for homeowners who can't get private insurance, could see up to a 10-percent immediate rate reduction and possibly up to an additional 10 percent cut. Roughly half of Citizens' 1.3 million policyholders live in Broward, Palm Beach and Miami-Dade counties. The legislative package rescinds a 21-percent Citizens' rate hike that took effect on Jan. 1 - promising refunds for any customers who have already paid it - and cancels a 56-percent increase that was set to take effect in March. "For too long now, Floridians covered by Citizens have been paying too much premium for too little service," said Rep. Ellyn Bogdanoff, R-Fort Lauderdale, whose windstorm insurance is with Citizens. But Rep. Susan Bucher, D-West Palm Beach, said lawmakers acted too late and have done too little. "What happened this weekend was cosmetic surgery when we needed to perform heart surgery," she said. "In reality, what we're offering … is maybe as much as 20-percent savings to our rate payers when they have been hit with triple-digit increases." Homeowners covered by private insurance, about two out of every three policies in South Florida, could see a wide range of reductions on their hurricane (windstorm) coverage, possibly some as high as 55 percent. State Farm, the state's largest private insurer, on Monday projected that its windstorm rates could drop by a statewide average of 19 percent. That figure could be as high as 25 percent in South Florida. Forecasters have predicted above-average storm activity during at least the next decade. If the state gets hit by a major storm or several hurricanes in one season, the Legislature's insurance fix would put Floridians on the hook for billions in damages. Deficits at Citizens would be repaid through extra charges on everyone's property and automobile policies, with life and health and medical malpractice and worker compensation policies exempted. If those assessments don't cover the red ink, state taxpayers would have to pick up the tab. "But if the big one doesn't come for 50 years, there's probably $200 billion (in premiums) that will be saved," said Posey, adding the ultimate solution is the reinforcement of Florida homes against the ravage of hurricanes. The insurance industry has blamed the high cost of private reinsurance - coverage insurers buy to help pay claims in the event of a catastrophic storm - for driving up rates again last year. 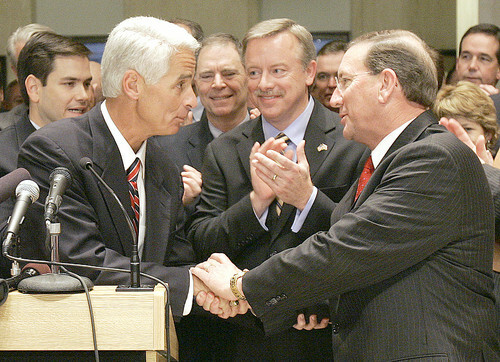 Insurance lobbyists mostly sat on the sidelines during the weeklong session, as Crist and legislators worked to help consumers and agreed to stop the practice of letting insurance companies raise their rates up to 10 percent before getting state approval. "There's not a lobbyist within 50 miles of the Capitol that supports anything that we've done, and that's a good thing," said Rep. Adam Hasner, R-Delray Beach. Lawmakers also opened the door for Citizens to expand its coverage, allowing the insurer to sell fire and casualty coverage to customers in high-risk coastal areas that now have its windstorm coverage. The theory is the competition from Citizens will help bring down everybody's rates. "If the private carrier can't sharpen its pencil and come down in rates, the consumer will have a choice," said Sen. Jeff Atwater, R-North Palm Beach, who pushed hard to reduce Citizens' rates. Within 30 days, Citizens will have to give the Legislature, the governor and Cabinet a business plan on how it would offer expanded insurance coverage. William Stander, assistant vice president of the Property Casualty Insurers Association of America, warned the Legislature's actions will "lead the property insurance market in Florida down a path of deterioration." Allowing Citizens to expand, he said, will cause it "to become a giant, lumbering beast that will threaten to financially ruin every man, woman and child in the state of Florida."